Since the early 1980s, forty-three marine sites have been inscribed on the World Heritage List, covering about 1.4 million km2 of ocean surface - an area about the size of the Gulf of Mexico. Each of these forty-three sites represents exceptional features in the ocean - features that are recognized by the international community for their outstanding natural beauty, exceptional biodiversity, or unique ecological, biological and geological processes. 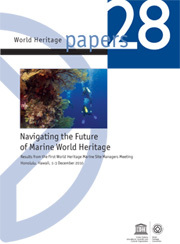 In recognition of mounting conservation challenges in marine areas, UNESCO's World Heritage Marine Programme decided to bring, for the first time, all forty-three site managers together in Hawaii, United States (1-3 December 2010) to discuss ways of strengthening the conservation of these special ocean places. This publication summarizes the conclusions and recommended actions from this meeting. The meeting focused in particular on the exchange of success stories, providing the basis for a stronger community of site managers, and the capacity needed to deal with the increasing complexity of conserving World Heritage marine sites. Almost 80 per cent of all marine site managers or their representatives attended the three-day meeting. During and after the meeting, a survey addressing threats and management gaps was distributed and completed by 90 per cent of all marine sites. Outcomes from this analysis are also discussed in this publication.